Dali Callisto hi-res multi-room system to debut at IFA | What Hi-Fi? The lid has been lifted a little higher on the Danish brand's long-teased offering, which will make its debut at IFA in September. Back in May we reported that the Danish speaker brand was teaming up with Lenbrook International aka Bluesound to make a new wireless speaker that uses Lenbrook's BluOS hi-res multi-room platform. But, alas, details were scarce. All we knew then was that this “multi-room system of some kind” (as we referred to it then) would finally see Dali entering the multi-room arena, and that the BluOS would be "an extension of its upcoming wireless speaker solution". Now, however, we have a name - Callisto (yes, sadly this seems to break the company’s trend of product names starting with ‘K’) - and a bit more info besides, thanks to the IFA website and some images that have appeared on Twitter. While Callisto is the name of the second-largest moon of Jupiter, it clearly hasn’t been chosen to indicate the size or shape of the system, which comprises a pair of typically Dali-looking standmounts, a pair of floorstanders, and a desktop-sized Sound Hub, to which you connect your sources. 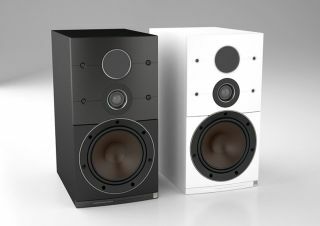 Much like the Wharfedale Diamond Active A1s’ arrangement, the speakers wirelessly connect to the Sound Hub – in this case over a 24-bit/96kHz connection. Sources can also be connected wirelessly via Bluetooth or directly through the Sound Hub’s twin optical, analogue, USB and coaxial inputs. The Sound Hub also appears to have a couple of neat tricks up its sleeve: an auto-detect input feature, and the supplied (Bluetooth) remote’s ability to communicate with the Hub even if it’s hidden away in a cabinet. As BluOS is brand-agnostic, the Callisto speakers will be able to connect to any BluOS-compatible device – Bluesound’s range of Award-winning products, for example – on the same wi-fi network, in order to share music libraries and playlists. The speaker architecture is more familiar fare for the brand, featuring a 16.5cm wood fibre woofer with a SMC magnet motor system, and a hybrid tweeter consisting of a 29mm soft dome tweeter and ribbon tweeter. Feeding the drivers is a dual channel 300W Class-D amplifier.